Liberal radio talk show host Randi Rhodes called it a career this past week (photo courtesy of PhoenixNewTimes.com). On Friday afternoon, I had to say goodbye to a frequent visitor into my daily life for the fourth—and probably final—time over the past six years but this one was on such good terms. 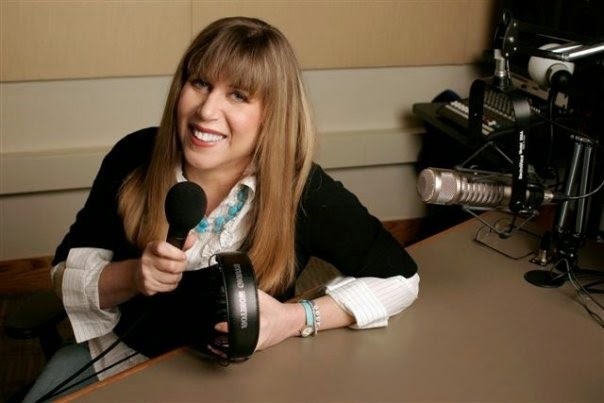 Liberal talk radio host Randi Rhodes, deciding that it was time for her to walk away from her 30-year profession, finished up her last three-hour program on Premiere Networks just before 6PM—normally referred to as “beer o’clock” by her and other on-air talent. 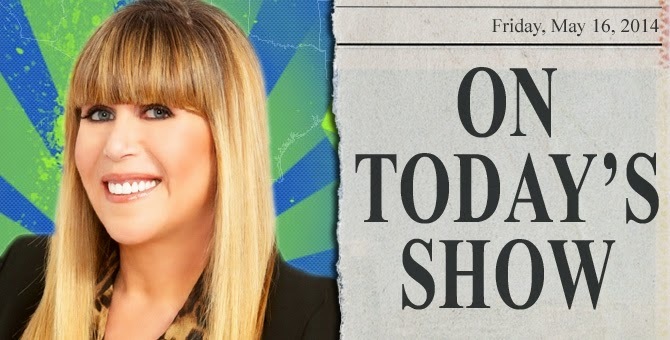 She made the announcement to her listeners and fans back in April, stating that it was her decision to leave just six months after facing a termination situation before securing support from the corporate syndicator/producer of The Randi Rhodes Show. The other two times prior to that November 2013 concession happened back in 2008 and 2009 when she left Air America Radio and Nova M Radio, respectively, under questionable contractual-related circumstances. A poster for Randi's Air America Radio show adorns the side of a phone booth in New York City (photo courtesy of RadioEquilizer). I first heard Randi’s program when I was getting ready to return to the US after a military tour in Japan. That happened in early April 2004 when Air America Radio was setting off on its much-ballyhooed “David vs. Goliath” mission against the well-entrenched conservative talk radio juggernaut. Although she was the only true radio personality within their lineup (Katherine Lanpher, Al Franken’s on-air sidekick, had some experience on Minnesota public radio), she was routinely overlooked by journalists and media elite who focused on the former SNL alum and the stand-up comedienne Janeane Garofalo in the run-up to their initial stints as talk-show hosts. In the 2006 HBO documentary on the start-up Left of the Dial, Rhodes vocalized those slights in the days leading up to the network’s kickoff but then tears into former consumer advocate (and Green Party presidential candidate) Ralph Nader on her premiere show to overtly “mark” her territory among the novices that she was surrounded by. 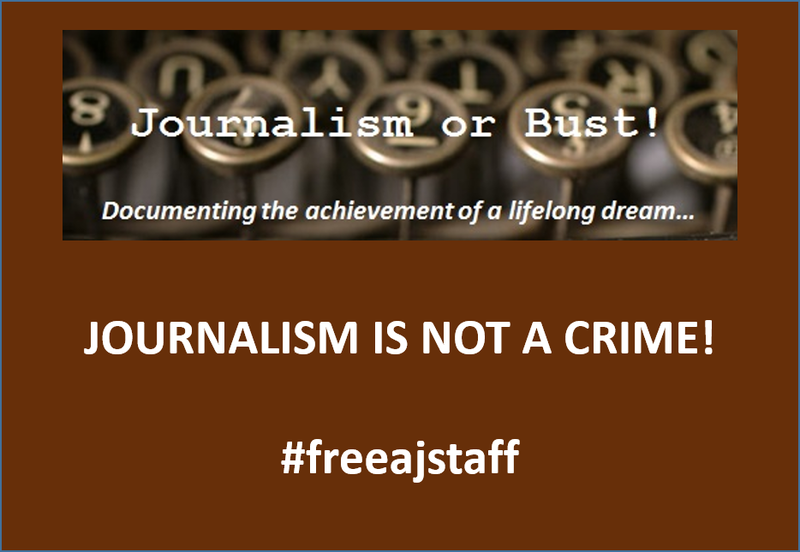 While successfully navigating a four-year run, her time with that station was, unfortunately, tarnished by the March 2008 stand-up routine she performed in San Francisco and the acrimony that it caused with Air America’s management and their attempted triage among progressive listeners and the politicians (former VP candidate Geraldine Ferraro and then-Democratic presidential candidate Hillary Clinton) she eviscerated during her performance. An immediate on-air suspension eventually led to her leaving Air America the following month. 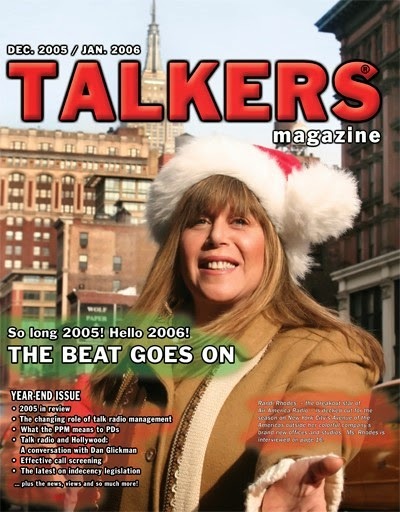 Randi graced the December 2005/January 2006 cover of Talkers Magazine, the trade industry publication for her profession (graphic courtesy of Wikipedia.org). I did not tune in (or should I say “stream in” because I had to listen via internet audio from a location 12-13 hours ahead of the East Coast) until their first full week on the air (April 5-9) and I must admit that I was trying to hear Franken’s show but I instantly became enamored by Randi’s voice and on-air style from that first visit. Not being a fan of the talk radio format prior to that time, hearing someone venting their spleen at a caller took a little bit of getting used to it but she reserved such conduct only when it was truly warranted. I continued to listen when I returned to Ohio that summer and even purchased a satellite radio subscription to allow me to hear her program (and the other offerings on Air America Radio) when I was away from home or the office. I kept up that patronage until I upgraded to a smart phone (with an unlimited data contract) and began listening through the TuneIn and iHeart Radio apps. In the later years, I was also an on-again/off-again podcast subscriber to allow me to download her shows to listen when I was working in a building that didn’t allow people to bring in their cellphones. 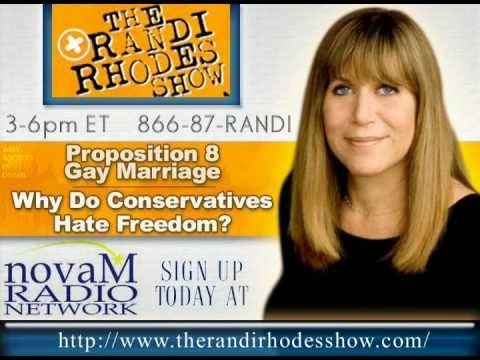 An online ad promoting Randi's show when she was on the Nova M Radio Network. In my opinion, Randi was authentic and she had the credibility in her business that puts her in the same strata as Rush Limbaugh, Sean Hannity and Bill O’Reilly (and her ratings demonstrated that she indeed bested them in several markets). While those other hosts must rely upon the talking points that migrate to them every day from Republican and conservative operatives, Randi immersed herself in a daily research regimen that she shared with her listeners via her “homework” page (her mantra was "don't take my word for it--look it up yourself"). She often declared herself a “prognosticator” and the vast majority of things she did correctly predict on the air were based upon that detailed preparation. As a stickler for perfection, I did notice on many occasions when she would “schmear” her facts in a heated moment or during the laborious lead-up to making a point on the air. For example, on this past Tuesday’s show, she said that former Senate majority leader Bill Frist was a “brain surgeon” instead of the heart and lung specialist that he actually is. To a casual listener, such a minute error was probably not noticed but it would “ding” her overall credibility when discussing an issue with a more informed audience. In this specific case, if she would’ve just called him a “doctor” or a “surgeon”, it would’ve fit in nicely with the point she was trying to make about his now infamous “remote” diagnosis of Terri Schiavo by viewing video tapes back in 2005 (I identified that mistake via Twitter but never received a response nor heard a correction by the host). Again, while the general point she was trying to make would normally be “spot on”, those slight errors ruined, for me, what would’ve been a total demolition of an opposing view or talking point. 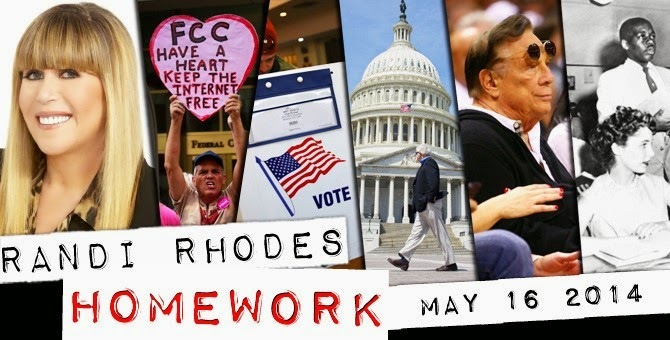 A graphic for Randi's last "homework" session (image courtesy of Randirhodes.com). 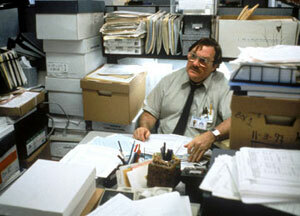 For her final six months, Randi was subjected to “radio purgatory”—a situation akin to the one Milton Waddams faced when his workspace was involuntarily moved down to the Initech basement in the 1990s cult movie, Office Space. While she continued to have terrestrial affiliates (and one via satellite), her show was also given its own channel on the iHeart Radio platform for those without a local station and it seemed to have been overlooked in terms of updating the between-segment information clips (one that ran at the beginning of today’s show featured remarks given by Vice President Biden at the funeral for former Israeli prime minister Ariel Sharon in mid-January). It also subjected the listener to some of the cheesiest sounding studio music tracks I ever heard on radio (none of those pieces—ranging from 60s surfing to 80s glam--were recognized by the Shazam music identification app). Much like the “downsizing” witnessed with fellow progressive host Stephanie Miller (who now works out of the basement of her home due to her former radio home literally kicking her to the curb when they switched to a conservative talk format this past January), talk radio is not as lucrative to investors or advertisers as it once was. 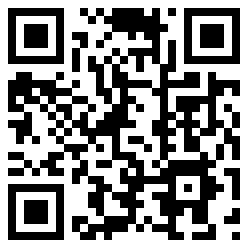 This is not limited to liberals as it is also happening to the likes of Limbaugh (his show is currently coming in at #39 in the Los Angeles area—the second largest media market in the country—and he has 12 non-English speaking stations attracting more listeners during his 9AM-12 noon program timeslot). Luckily for him and his “wannabes”, they have wealthy benefactors who buy up advertising time and buoy the bloviators for the foreseeable future due to their critical role in fomenting anger within the base of the Republican Party—the target audience for that particular political radio format. 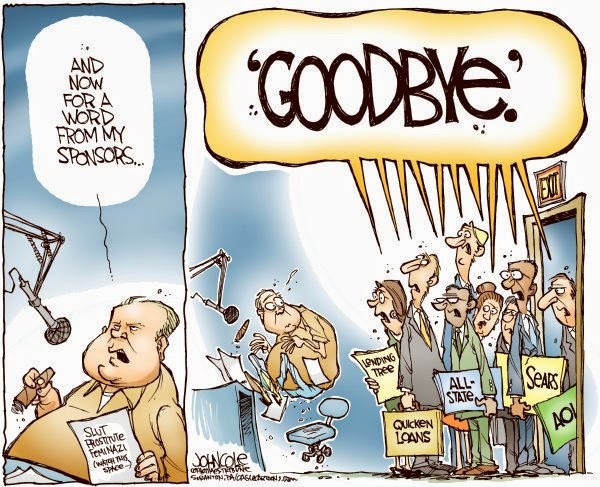 Sponsors, unfortunately, are fleeing all formats of political talk radio (cartoon courtesy of John Cole, The Scranton Times-Tribune). As I tweeted during the final program, it had the feeling of attending a two-week “wake” for the host after returning from a previously scheduled absence earlier this month. Many listeners called in to express their sorrow over Rhode’s decision to permanently leave the microphone. Since my own relationship with her encompassed only 10 of her 30 years, I enjoyed hearing some of the items from her DJ days (the remote where she tried to get the man complaining about how loud the audio was to move away from the speakers was priceless) and from her local talk career prior to going national in 2004. Her interviews with former president Bill Clinton and future president Barack Obama displayed her more genteel side but they were not “softball” appearances that Republican politicians seem to get when appearing on conservative media outlets. Randi gets a message on her smartphone about her Twitter "trending" during the final show on Friday (screen capture courtesy of Randirhodes.com). Billed as a “graduation”, Randi’s last show definitely had the feel of a military retirement. She and I share something in common—both of us were Air Force enlisted members and our active duty careers had a slight overlap (she went in before me and I stayed a long time after she got out). When I had my military retirement ceremonies (due to geographical and family issues, I had two), people from various portions of my career were in attendance as well as sending their greetings (a former commander got his in at the last moment a la Sam Wainwright’s telegram in the closing scene of It’sa Wonderful Life). While there were some tears shed, the mood was mostly cheerful because I was transitioning to my life’s next chapter. Surrounded by friends, coworkers and loved ones in the studio (and the aforementioned Miller blubbering over the phone during the final half hour), she closed out her radio career in a dignified and almost serene manner. With the website still functioning and iHeart playing the final show in an endless loop this weekend, the most diehard Randi fans can wean themselves off of her instead of having to go “cold turkey”. I never felt compelled to call in and identify myself as a “FTLT”—“first time, long time”—to get my radio cherry “popped” but I hope that this post will serve as my feedback to a host that I admire and respect. I know that she said that the music on her show was awful, but I will be compiling a playlist of the “bumpers” to go along with the podcasts that I still have as fond remembrances of our many hours together (I wonder if iTunes has Rusty Warren’s “Bounce Your Boobies” for download?). I'd like to close by borrowing a Navy phrase and wishing her and Howard "the Howard" Vine “fair winds and following seas” for the next phase of their life journey in Costa Rica. 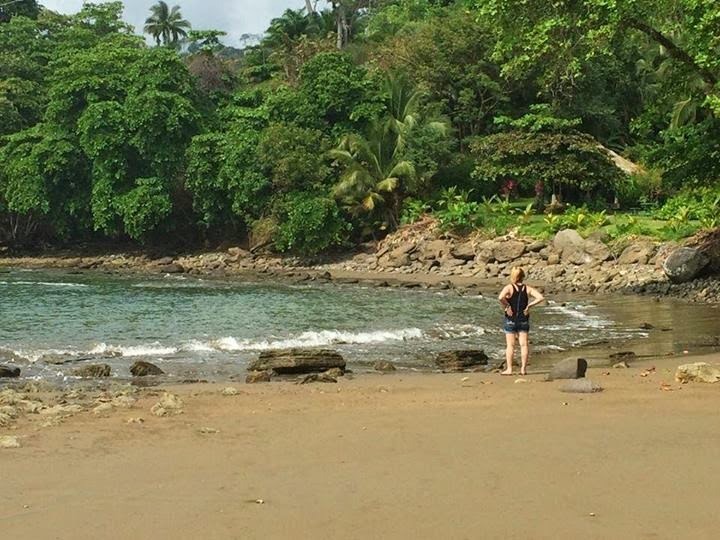 A photo of Randi standing on a Costa Rican beach during a December 2013 visit to the Central American nation (photo courtesy of her Facebook page).